Burnley Road School is a victorian school built 126 years ago. But there are many hidden new additions including our new foundation stage building which are at the back of the school. The school was built in 1879 and extended in 1958. The school has 8 classrooms, hall, library / computer suite, resource room, staff room, kiln room and our own extensive sports field and wildlife garden. Mytholmroyd is a small village about a mile from Hebden Bridge in West Yorkshire and set amongst beautiful picturesque hills. There is an active and innovative business community, and the village is home to the largest comprehensive school in the area, along with some lively pubs and some excellent country walks. 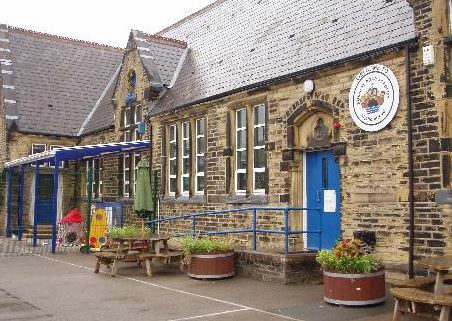 Our school lies between the Rochdale Canal and the River Calder in Mytholmroyd. This is the view from our back playground and is why we have the bridge on our school logo. Mytholmroyd is the birthplace of the late poet laureate Ted Hughes who died in 1998, and was the home of David Hartley, or King David – the leader of The Cragg Coiners. An annual Dock Pudding Competition is held at Mytholmroyd Community Centre in April and Mytholmroyd Gala takes place in August and is hosted on our playing field. Royd Regeneration, and Roof over Youth are ongoing projects for the village. It is also planned to turn the “Old Railway Station” into a “Ted Hughes Centre”.